Transition Town Forres started in 2008 as an environmental charity and part of the now 3,000+ strong international “Transition” movement. and this is a little while later. 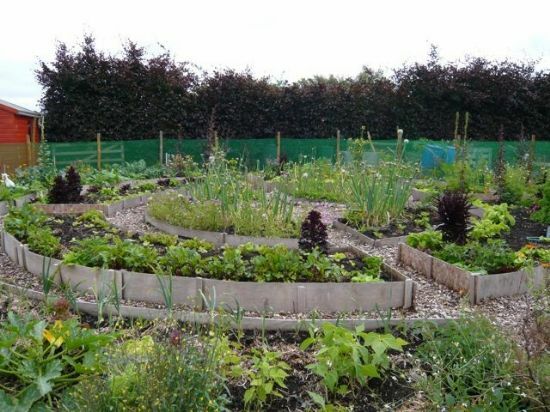 Up to 70 gardeners have their own individual plots of about 50m2 and a full acre of land has now been cultivated for 5 seasons. 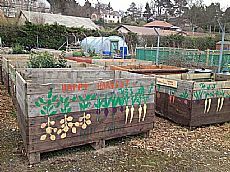 In addition to this successful project we now have 35 old “tattie boxes” that are given a new life as raised beds. 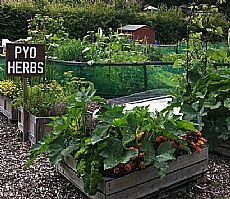 The tattie boxes are used primarily for food education and production for the “healthy living centre” which is our new teaching space, completed this spring. Our venue was a relatively new shed but just a shell. We raised a lot of money and the shed was converted during 2013 to a functional venue for teaching and administration of TTF. Early this spring (2014) we completed the educational kitchen with a mobile teaching unit. We can now set up 5 cooking stations in our main room, each station complete with individual induction hobs, knives, cutting boards, etc. 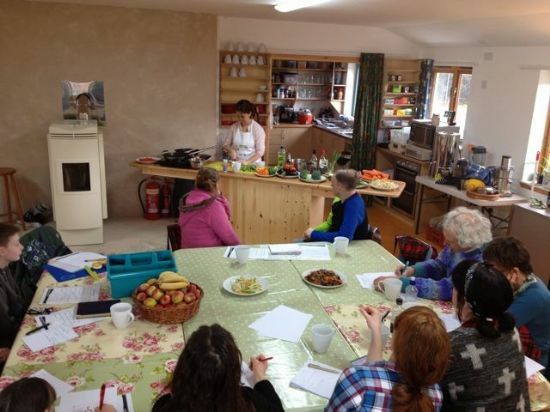 We delivered 24 cooking classes in February and March and we are now evaluating what kind of courses the people of Forres would like us to provide. In this space we also provide a decent reference library with both books and DVDs that members can borrow. 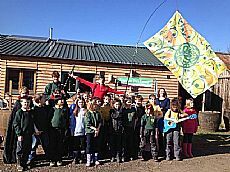 TTF work closely with many other local groups in Forres and Moray. 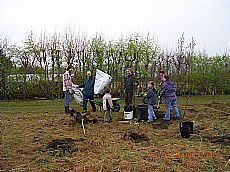 School children gladly helped when apple trees needed planting this spring. We sold almost a tonne of seed potatoes in March this year, with a lot of much appreciated help from TBI’s Agric. 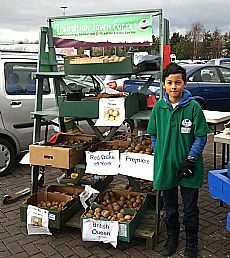 With the help of a young volunteer we had a morning on our local Tesco car park with many appreciating customers. 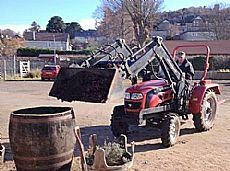 One of our slightly older volunteers is Bert Logi, who handles our tractor with skill and confidence. 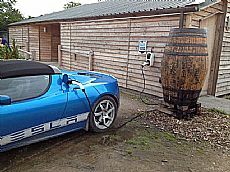 Last year we received an electric charging station from Zero Carbon World. It is installed and works really well. The local car-share club has two electric vehicles. 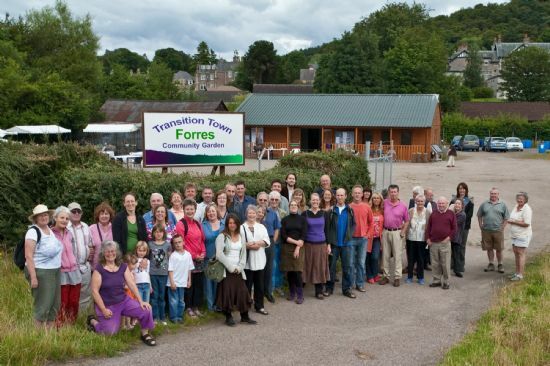 Transition Town Forres now has about 150 registered members. We keep our Centre open from 12-4 every week day and often over the weekend. The public is welcome to come in and ask questions about “transition”. Every Sunday we have put on a car boot sale which has brought yet more people to our site. Transition Town Forres is now looking to the future, and asking what we can do to continue to increase the resilience of Forres and beyond. We are contemplating monthly regular meetings, film nights and parties. Do get in touch if you have an idea you’d like to be part of spreading. TBI is very grateful to Transition Town Forres, and especially their Treasurer and Company Secretary Carin Schwartz, for providing the story and pictures for this page; and in return TBI's Convenor Anne Thomas is preparing similar information about TBI for TTF. 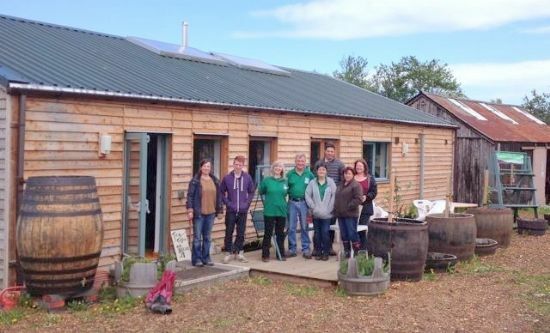 We also congratulate Transition Town Forres on taking first place in the Environment category in the TSI Moray Social Enterprise Awards on Friday 14 March. Richard Lochhead MSP, presenting the award, singled out TTF’s electric vehicle charging station as key to their success.